We’ve talked before about places and things that exist in the real world that—were you to stumble across them in an open-world video game—would make you call shenanigans on the programmer. Some of theses things are spooky, some hilarious, some rather awe-inspiring—and all seem to exist solely to reward the “player” for looking in just the right spot with something way out of the ordinary. 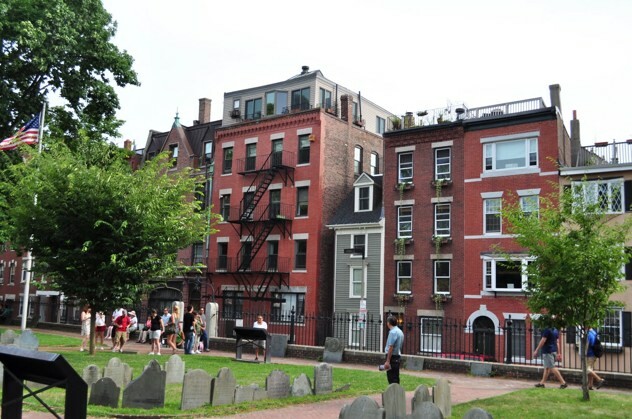 Along the Freedom Trail on Hull Street in Boston, there are a row of pretty unremarkable buildings—unremarkable except for one, that is, but if you blink you’ll miss it. It is the “uncontested narrowest house in Boston” and has come to fittingly be known as the Skinny House. Various local legends compete to explain why this house exists, but most agree that it was built as a “spite house”—that is, in order to block the view and sunlight of the neighboring house. One variation has it that the house stands on a plot of land bequeathed to two brothers, one of whom built a huge house taking up all but a sliver of the plot while the other was at war. The returning brother decided to build on the little sliver anyway, and destroy the nice view from his brother’s big, new house in the process. The four-story house is just over ten feet wide at its WIDEST—and narrows to just over six feet at its narrowest, skinny enough for an adult to touch opposite walls with arms outstretched. The current owners have been profiled by the Boston Globe, which described them as living a “vertical life“. 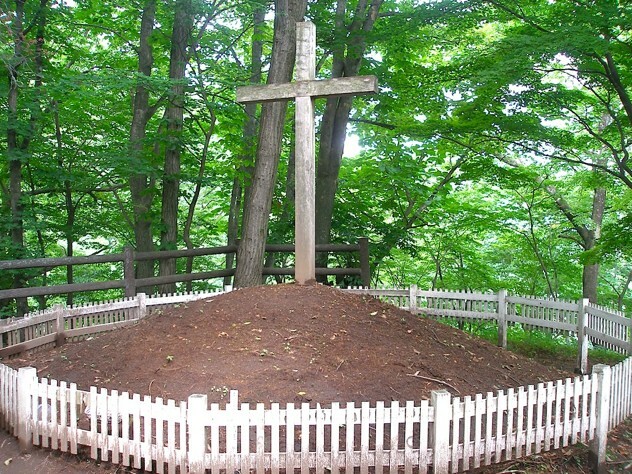 There is a legend of very mysterious origin in the small Japanese village of Shingo which revolves around the region’s only tourist attraction—a large cross, with a plaque explaining that it is the burial place of Christ. Jesus Christ, that is, who is supposed to have died in a place very far from Japan under circumstances quite different from those described on the plaque. According to the legend, which began when alleged Hebrew-language documents known as the Takenouchi documents were discovered by a local by that name in 1935, Jesus did in fact NOT die on the cross—his brother took his place and died in Calvary, while Jesus escaped to Japan to lay low, become a rice farmer, and have several children—eventually dying of natural causes at the ripe old age of 106. The Sawaguchi family of Shingo are supposed to be directly descended from Christ, though they are Buddhists and appear to take the whole thing with a grain of salt, as Buddhists are wont to do. Also, the purported documents went missing (sounds familiar), have never been found, and supposedly also went into detail about ancient aliens and Atlantis, so there’s that. None of this stops hundreds of tourists and journalists each year from being curious enough to seek out the grave of Japanese Jesus. While hiking through the Italian Alps, it would be natural to be overwhelmed by the scope and beauty of the surroundings; the rolling hills, the lush valleys, the crisp mountain air—it’s a famously beautiful region. It would also be natural to be similarly overwhelmed, coming over the crest of one of said hills, by the mind-boggling size of the immense, stuffed pink rabbit sprawled out before you. The bunny is the work of Viennese art collective Gelitin, who installed it on the side of this mountain in 2005, where they expect it to remain until at least 2025, by which time it should have been destroyed naturally. The rabbit is stuffed with straw, is 200 feet long—about 2/3 the length of an American football field—and yes, you’re seeing that right; its stuffed, colorful entrails are spilling down one side of the hill, which isn’t due to damage. It was made that way, and we’re not asking why. 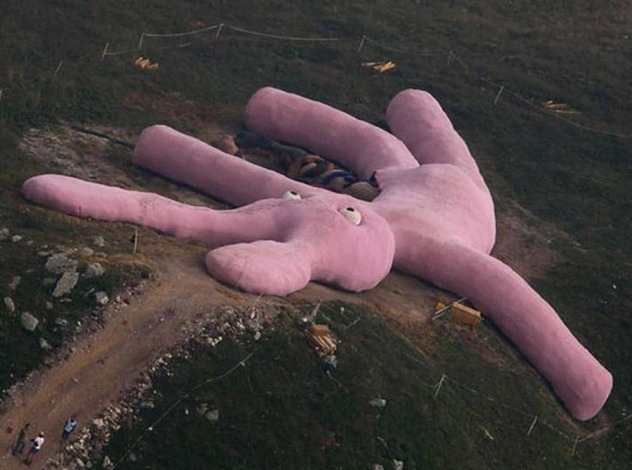 Visitors are encouraged to climb around on the 200 foot, partially eviscerated pink bunny and stay as long as they wish, which for us would not be very long. Why a giant rabbit? To make you feel “small as a daisy”, says one group member, to which we repeat: why a giant rabbit? In an otherwise deserted park in a suburb of Ängelholm, Sweden, lies what at first glance appears might be a lonely piece of playground equipment. It is not—it’s a memorial. 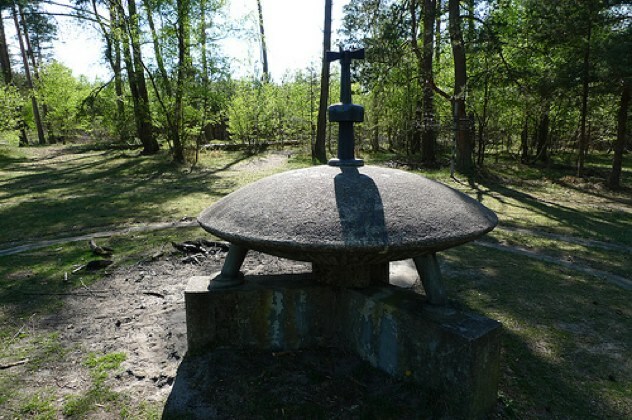 To a UFO landing that took place at that very spot on May 18, 1946, and was witnessed by Gösta Carlsson, the founder of Swedish pharmaceutical corporation Cernelle. It is supposedly a model of the actual UFO that landed at the site, and the concrete tracks circumnavigating it aren’t just cosmetic—they’re the landing traces. Not only was Carlsson supposedly the sole witness to this, but he claims to have received recipes from the aliens for remedies and medicines, which made him healthy—and which he used to found his company. As awesome as this story is—and despite the memorial—it’s largely disbelieved even by UFO enthusiasts. Even Clas Svahn, the co-author with Carlsson of a book about the event, admits there is no compelling evidence that it ever happened. Those who live in the Boulder, Colorado area—or have visited during the holiday season—are treated to a unique sight for six weeks or so each year. 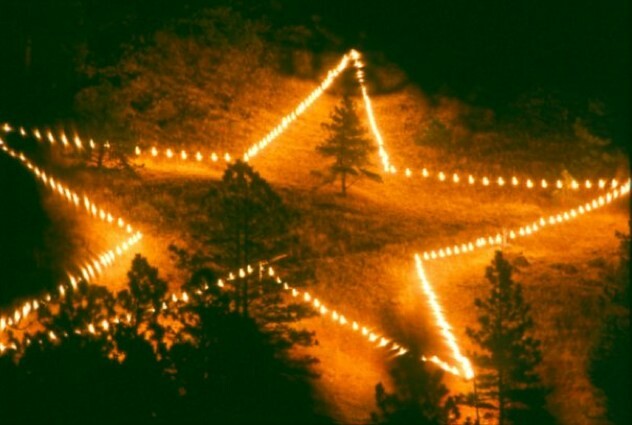 From November 19 until New Year’s Day, there is a gigantic star emblazoned on the side of Flagstaff Mountain overlooking the city—every year since 1947. The star has had a lot of ups and downs, and has been in danger of being permanently retired several times—sometimes because preventing vandalism has occasionally proven difficult, but mostly because of energy consumption concerns. Hundreds of light bulbs, shielded from the elements and perched atop ten-foot steel poles, are used to light the mountainside. These days, the star is completely wind powered. Many residents make pilgrimages to the star to see the arrangement up close, but for most it’s just a pleasant, glowing reminder that it’s the holidays once again. 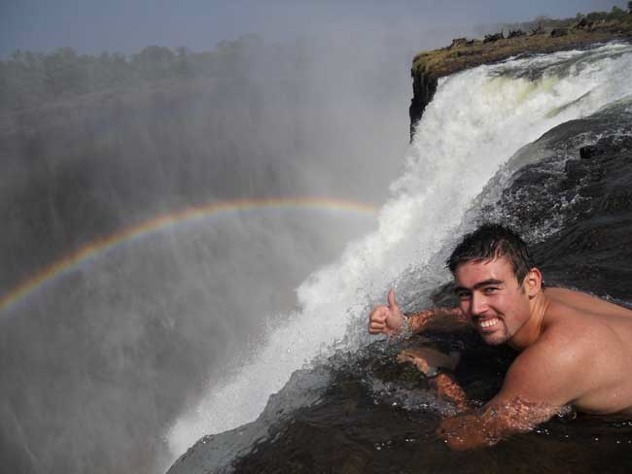 Images like those above are usually taken to be hoaxes by those not familiar with this odd feature of Victoria Falls, on Zambia’s border with Zimbabwe. During the dry season when water levels are at their lowest, a naturally formed rock wall creates an eddying pool along one section of the falls, a section that’s safe to swim in—literally right up to the edge of a 328-foot abyss. Visitors must follow a certain route across rocks and shallow pools to reach the area safely. Of course, there’s another way to reach it—to jump in, and allow oneself to be carried downriver toward the falls at dizzying speeds, where it appears for all the world that certain death is waiting, pointing and laughing. But as one approaches the pool the current evaporates, and guests are able to actually peek right over the edge—as seen in the pictures—completely safely. While the pool is safe enough even for small children to play around in, there seems to be two pretty well-defined types of visitors—those who paddle around, contemplatively beholding the wonder of their surroundings, and those who simply can’t stop screaming. Most of us are familiar with the effect that raised pavement markers can have on the sound of our cars when driving over them—that fast-vibration rumbling that can range from annoying to alarming, depending on your vehicle. A few clever engineers worldwide have taken advantage of the different tones that can be produced by different marker heights, arranging series of markers in order to make stretches of road that actually make your car rumble out a little melody when driving over them. The first of these was constructed in Denmark in 1995, and Japan quickly followed suit. One of the most famous musical roads is the one built for a 2008 Honda Civic commercial near Lancaster, Pennsylvania; its design is a bit different but produces the same effect, using grooves cut into the asphalt to play a portion of the “William Tell Overture”. Only a handful of these exist in the world, and all have signs and/or painted road markings pointing them out—probably to keep bleary-eyed commuters from wondering if they’re going nuts, or if their car really was just humming the Lone Ranger theme. Put simply, the spillway known as “Morning Glory” is the largest spillway in the world. Spillways are built into dams to relieve pressure on them, and this one serves that purpose for the Monticello Dam, which holds back Lake Berryessa in California’s Napa Valley. That is the dry, practical explanation for the impossible sight in that picture. Located only 200 feet from the dam itself, the concrete spillway—known as the “glory hole” to locals, which we will not dignify with further discussion—is 72 feet wide, and can handle an unbelievable 362,000 gallons of water per second. To answer the question most of you have in mind—only once. 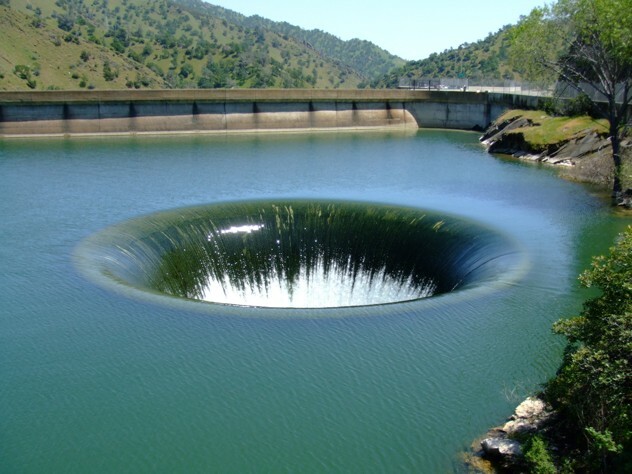 In 1997, a UC Davis student was sucked into the hole and drowned, but that’s the only known time, because exactly one person has been brave or stupid enough to swim anywhere near that thing. We’re sure it is an impressive enough sight to see in person, but photos of it in operation really only look like one of two things—a Photoshop, or the very beginning of a black hole forming under a lake. 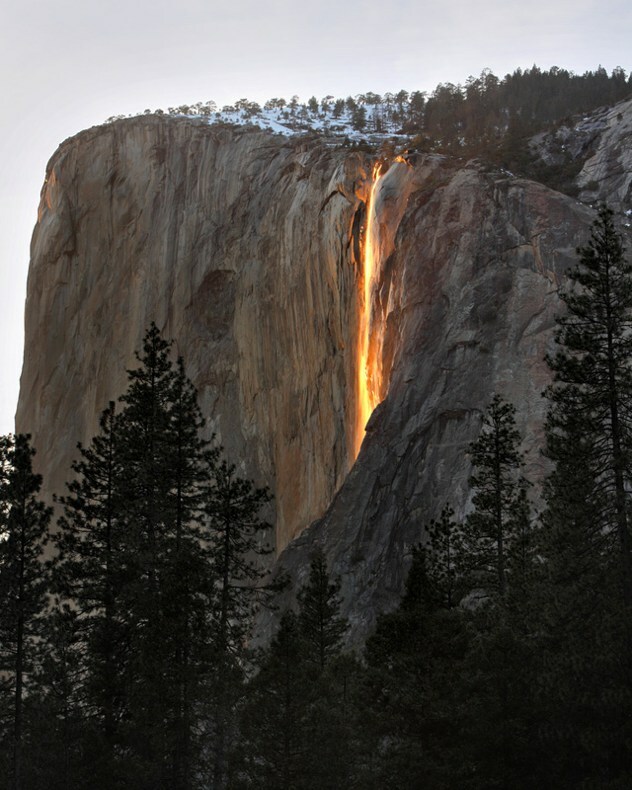 Yosemite National Park has a wealth of astonishing sights, but among the highlights is Horsetail Falls. Especially at a very specific time of year, when the 2,000 foot cascade suddenly appears to catch on fire. Photos that appear to show liquid magma spilling down the sheer cliff face are really just capturing a natural trick of light—at a certain time in February, at a specific time of day (around 5:30 PM), the setting sun strikes the face of the cliff in just such a way; according to visitors, it briefly becomes tough to even make out the waterfall—and then it illuminates, all at once and in startling fashion. So convincing is the effect that some visitors refuse to believe that it isn’t actually lava, despite having seen the falls with their own eyes just moments previous. Strangely, a hotel owner in the late 1800s actually did push hot embers over the edge of the cliff on a regular basis, to create a night-time light show for his visitors—which was of course a ridiculous fire hazard, in addition to not being nearly as spectacular as the natural phenomenon. The waters off of Key Biscayne, Florida, are a popular spot for scuba divers. Three miles out, on a certain half acre of land 40 feet below the surface, divers can stumble across the biggest Easter egg of them all—and it’s just getting started. Neptune Memorial Reef is already the world’s largest man-made reef, and plans call for it to be far, far larger by the time of its completion in ten years or so. 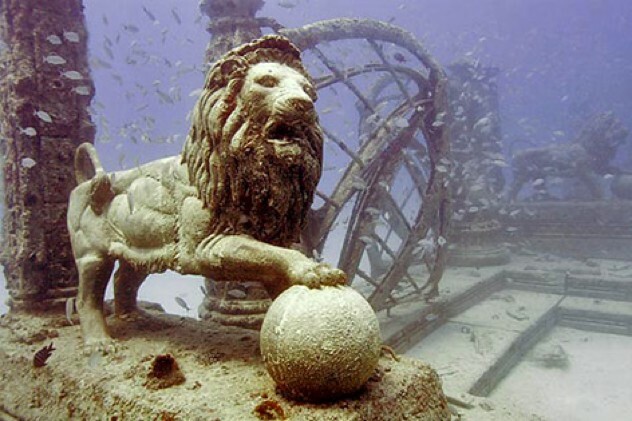 The stunning underwater features include statues, columns and arches weighing several tons, underwater roads leading to a main confluence—and some of these features put the “memorial” in the name of the place. You see, Neptune is variously advertised as an underwater cemetery or mausoleum. Mixed with the features’ cement are the cremated remains of the dearly departed, some of whom paid thousands of dollars for the privilege, with memorial plaques accompanying their features. When completed, the Reef is expected to cover SIXTEEN acres of undersea real estate, and be capable of accommodating 125,000 remains.